This is not a wine blog. But I really love good wine and I’m mad at the discovery of new bottles, and that’s why this is the second post about wine in less than a month. To tell the whole truth I won’t speak about the (note: landing page in Italian) marvellous Lambrusco that I found last year in a wine show in Mantua but I’m going to tell you about an experience. 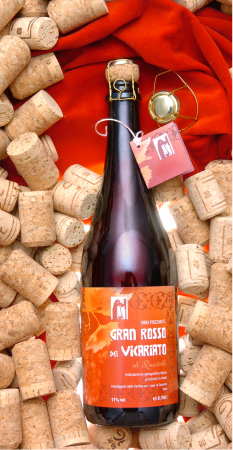 The Gran Rosso del Vicariato is a strong, sparkling wine produced by the Cantina Sociale di Quistello (Quistello is a really small municipality near Mantua) and, in my humble opinion, is the very best Lambrusco I had the chance to taste. As I was saying I discovered this wine back in December 2008 and bought just some bottles to give it a try; I seldom travel to Mantua (even if it’s my home-city) and just to meet with parents and relatives (or do some shopping, as my wife Barbara would add ) so I have really no time to travel 40Km just to buy some (albeit very good) wine. While at home, on Monday, a tried a look at the Cantina website for infos about their ecommerce. What I found was an old-fashioned (1997?) website with no info about ecommerce chance or even an email to address orders. I chose the old way and give them a call, just to ask where I could have bought their wines in Milan, with arising doubts about having any chance to find those bottle outside Quistello. I was wrong. Definitely. Eh eh. I, with no delay at all, talked to a very polite girl who told me that, not only I can find their wines in some wine shops in Milan, they have a truck travelling to Milan each week (!!) and that I could have placed an order by phone and pay by bank transfer. I was stuck at my Mac, facing their old-fashioned web site, thinking of the high quality of the service they were offering (the minimum order is 36 bottles, or something like 60 euros – expedition expenses included !!). I’m not talking about Champagne, I’m talking about one of the cheapest wines in Italy (but – if you lived in Mantua – that is THE wine). And talking to a girl that was saying that having those bottles delivered to my home, or at ANY other address in Milan was soooo simple. That was Monday. This morning at 10 I had the bottles in my office. Delivered by a guy of the Cantina Sociale and his Iveco Daily: he takes care not to ruin the boxes or – argh – to break the bottles. So, what are the key points of this experience? Communication with the vendor was status of the art: immediate, transparent, complete. This has been a great lesson to me. I usually move away from companies without a good web site. I’m happy to have picked up the phone, this time. This entry was posted in Beef and tagged Add new tag, food, life, personal, user experience, wine by admin. Bookmark the permalink. Talking to humans? You mean, by vibrating membranes in your throat pushing air that ends up making some stuff in some people’s ears vibrate as well? Fascinating.